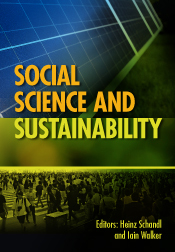 We are delighted to announce the release of the new book Social Science and Sustainability (Eds. Heinz Schandl and Iain Walker) on 1 June 2017. Sustainability policies shape the ways that society and the economy interact with the environment, natural resources and ecosystems, and address issues such as water, energy and food security, and climate change. These policies are complex and are, at times, obscured by contestation, uncertainty and sometimes ignorance. Ultimately, sustainability problems are social problems and they need to be addressed through social and policy change. Social Science and Sustainability draws on the wide-ranging experience of CSIRO’s social scientists in the sustainability policy domain. These researchers have extensive experience in addressing complex issues of society–nature relationships, usually in interdisciplinary collaboration with natural scientists. This book describes some of the evidence-based concepts, frameworks and methodologies they have developed, which may guide a transition to sustainability. Contributions range from exploring ways to enhance livelihoods and alleviate poverty, to examining Australians’ responses to climate change, to discussing sociological perspectives on sustainability and how to make policy relevant. Researchers, policy-makers and decision-makers around the globe will find this book a valuable and thought-provoking contribution to the sustainability literature. It is also suited to academics and students in postgraduate-level courses in social sciences and sustainability, or in courses in applied sociology, applied social psychology and other applied social sciences. Post from Prof. Simron J. Singh about Banting Postdoctoral Fellowship of University of Waterloo. The Fellowship is for those who wish to spend some time in Canada at a Canadian University as a postdoc. The competition has just been launched. This link is to attract scholars (Canadian or international) to Waterloo. I am particularly keen to review and help potential candidates who wish to work with me on an exciting IE topic. the ISIE council has approved of a task force on data transparency (cc) to develop proposals for how to increase the transparency and data availability of industrial ecology research, including MFA. The rationales behind the initiative are i) to speed up progress and facilitate cumulative research by making more data easier available, ii) to increase the usage of research results outside our own field, and iii) to respond to the increasing number of transparency demands from research funders. + an MFA article surprised you by publishing its entire or large parts of its data inventory alongside the final results? + the authors of an MFA study made part of their data inventory public whilst at the same time protecting specific proprietary data points? + a recent article managed to format its data or results such that they were easy to import and re-use? + a recent publication was accompanied with methods such that you could readily reproduce all its calculations and data manipulations? 2) To encourage data sharing we want to point to specific data formats. In MFA a widely accepted data format, that could play a role similar to the one of ecospold in LCA or SUTs in IO, is still absent. Based on previous experience from working with Daniel Müller and with input from Rupert Myers, who is currently building a database for the STAF project at Yale, I developed a template that lists the mandatory and optional attributes and descriptors of MFA data that are needed when exchanging MFA data from one researcher/project/software to another, and that could be developed into a data format later on. The template is attached; it includes some examples for datasets and detailed explanations. It is meant as a point of departure to establish a minimal consensus of how MFA data should be structured, and it is clear that many MFA results will require additional specifiers, represented as columns in the template, to be fully described. The plan is to publish the attached template as supplementary material along with the forum piece. On behalf of the task force, I would very much appreciate your input on transparent MFA research and your feedback on the data template! Maybe there is a data expert in your group who could contribute to the process? Please respond by April 30 so that we have time for revisions and a possible second feedback round. Also, please forward this email to colleagues who also might be interested! The second edition of the Handbook of Material Flow Analysis by IS4IE members Paul H. Brunner and Helmut Rechberger has recently been released. The Handbook continues to serve as the only book on MFA, it provides MFA definitions and describes all the relevant MFA procedures from the framework of Anthropogenic Metabolism. It features a concise description of MFA freeware STAN, explores a fresh, data-based treatment of uncertainty and contains new case studies about resource and waste management. management, waste management, and environmental protection. FREE standard shipping when you order online. The Journal of Economic Structures is calling for papers on "Multiregional input-output analysis for global resource policy". The Special Issue aims to summarize the recent progress of MRIO analysis focusing on natural resources and to understand its potential for the design of global resource policies. We are inviting papers on the analysis of natural resource use with MRIO models and welcome any analysis on specific resources or specific countries. Submission deadline for abstracts is 31 May 2017. The membership of the Socio-Economic Metabolism section of International Society for Industrial Ecology will be probably interested in the call for papers attached to my letter. CASES (Change and Adaptation in Socio-Ecological Systems) is an open access interdisciplinary journal that deals with the interrelations of human beings with ecosystems in sustainable land use and land development. Growing material requirements of the global society performs as the main driver of unsustainable development paths. Utilization of increasing amounts of natural resources will lead to significant changes in the ecosystem, to which adaptation capacity is uncertain. This special issue will include submissions from the meeting “The Size of The Society – International workshop on linkages between material flows and stocks of socio-economic metabolism” (Debrecen, Hungary, January 27-28, 2017) and is open to contributions from other researchers dealing with these topics. Articles submitted to CASES Special Issue will deal with theoretic issues and evidences for crucial role of material stocks and flows in the socio-ecological systems. CASES (Change and Adaptation in Socio-Ecological Systems) is an interdisciplinary journal that deals with the interrelations of human beings with ecosystems in sustainable land use and land development. Socio-Ecological Systems are a leading and internationally approved concept for understanding, describing and modeling the complex human-nature environment. By focussing on socio-ecological systems, we open a wide view on many complementary disciplines that help us to develop a vision of the world of tomorrow. Feel invited to join and share your ideas! The authors are kindly invited to register at CASES paper processing system and submit their contribution using a special track established for this Special Issue (Size of the Society). All papers will go through CASES high standards, quick, fair and comprehensive peer-review procedure. In case of any questions please contact the Coordinating Editor Mihály Dombi or the Journal Editor, Christine Fürst. ISIE’s SEM section is the largest global network of researchers employing material flow analysis as a tool for environmental sustainability assessment. This site aims to keep members up to date with news about the section's activities.